Product DescriptionThe Tetra Pond Debris-Handling Pump provides clog-free performance for pond filters, waterfalls or streams. It features a pre-filter cage that prevents leaves, sticks and other large debris from entering the unit, and also protects fish from the pump’s impeller. This powerful, energy-efficient and UL listed pump is engineered for continuous operation and can handle debris up to 1/4 inch in diameter – allowing you to clean your pond, not your pump! This pump is engineered to circulate large volumes of pond water without clogging, which allows the pump to operate for long periods of time without any maintenance. Water, dirt and debris are drawn through the quarter-inch holes in the large pre-filter cage that surrounds the pump. 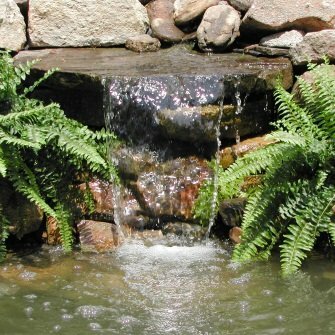 Pond water with dirt and debris are pumped to an external filter for removal or directly to a waterfall or stream. Since 1951, Tetra has developed the world’s most comprehensive body of fish food knowledge, and fishkeeping enthusiasts have looked to the brand for products and solutions that add ease and beauty to their home. Whether you’re an experienced hobbyist or just starting out, Tetra has everything you need – from a large variety of quality fish food and innovative equipment to test kits and decor. The TetraPond Debris Handling Pump provides clog-free performance for power filters and waterfalls. 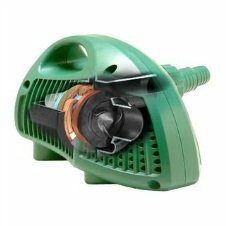 This energy efficient pump is engineered for continuous operation and can handle debris up to ¼ inch in size—allowing you to clean your pond, not your pump! 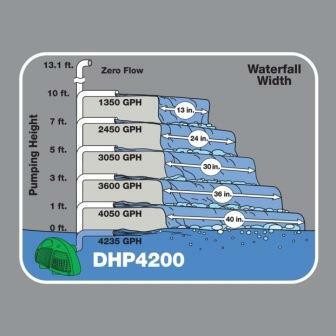 TetraPond DHP pumps are engineered to circulate large volumes of pond water without clogging. This allows the pump to operate for long periods of time without any maintenance. Water, dirt, and debris are drawn through the quarter inch holes in the large pre-filter cage that surrounds the pump. The pre-filter cage prevents leaves, sticks, and other large debris from entering the pump. It also protects the fish from the pump’s impeller. The open-face impeller allows debris up to 1/4 in. in diameter to pass through the pump without clogging. The pond water with dirt and debris are pumped to an external filter for removal or directly to a waterfall or stream. Determine how high you waterfall will be from the pond surface. 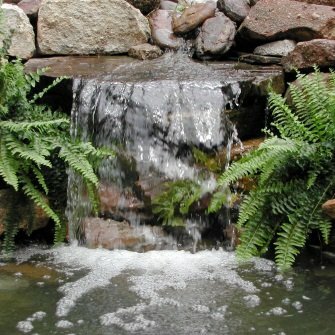 The higher the top of the waterfall is from the pond surfaces, the less flow will result. 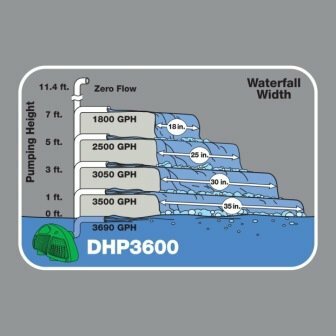 Take a look at the charts below for the approximate waterfall effect the DHP pumps will create at various pumping heights. Pond Circulation: Choose a pump that will circulate 100% of the pond volume in one or two hours. More circulation will result in better pond conditions. Filters: Be aware that filters reduce the flow to waterfalls and streams. The image on the left shows water pumped at three feet without any filter restriction, while pumping at three feet with a TetraPond pressure filter reduces flow by about 45%. CONTINUOUS-OPERATION POND PUMP: For powering pond waterfalls and streams with rugged debris-handling impeller that can pass debris up to 1/4 inch in diameter. CLOG-FREE PERFORMANCE: Large basket minimizes blockage and maintenance. WEAR-RESISTANT: Motor has anti-corrosive ceramic shaft for longer life. SIZED FOR YOUR POND: For ponds up to 4,000 gallons.